In 2002, The Tea Party toured Canada with a full Symphony Orchestra following the release of their Interzone Mantras album (whilst also touring Australia 3 times that year alone!). The Orchestral Show has never been performed outside of Canada or since 2002. TEG Live is proud to announce for the first time in Australia, The Tea Party will perform with the iconic Melbourne Symphony Orchestra for one night only. The event is exclusive to Melbourne and will be staged at the home of fine music, Hamer Hall at Arts Centre Melbourne. The show is being updated from its Canadian origins to incorporate songs from its entire career including their epic and bombastic hits. Since its inception, the band has relied heavily on the use of Middle Eastern instruments to provide a unique twist to their hard rock style. Instruments such as Oud, Sitar, Qanoun, Hurdy Gurdy, Theremin, Rabob, Tabla and many unusual and rarely seen percussive instruments feature heavily through their catalogue and many of these will feature in this unique performance. A full Symphony will lend a dramatic turn to these songs with spectacular arrangements and the band is thrilled to work with such a world renowned orchestra. Incredibly, this will be The Tea Party’s 16th tour of Australia since 1993. 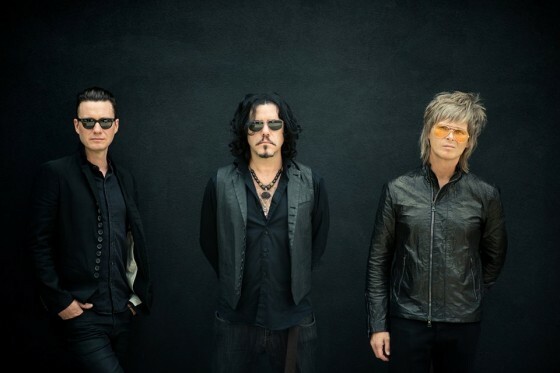 The three founding members of the band, Jeff Martin, Jeff Burrows and Stuart Chatwood are looking forward to sharing this special experience with their Australian fans. The Melbourne Symphony Orchestra is no stranger to collaborations with contemporary artists. Alongside performing core classical repertoire, the MSO has worked with a variety of artists from Elton John to Flight Facilities, the latter collaboration earning the Orchestra an ARIA Award for their live album recorded in 2015. Melbourne has always been home to some of the most dedicated Tea Party fans in Australia and given Melbourne fans have consistently packed out multiple nights at the Forum, The Palais and Festival Hall throughout their career, this unique setting and performance is going to sell fast. VIP ticketing, meet and greet packages will be available for sale. Tickets on-sale: 10am Monday 24 October 2016. TOUR DATE: Friday 28 April, 2017 – Hamer Hall, Arts Centre Melbourne.